After thinking for a very long time (a few years to be exact), I decided to invest on a cast-iron skillet pan. I went off to my favourite vintage cookware store (sorry, ain’t going to reveal the name and location of the store) and picked up a 9” Le Creuset skillet pan. I brought along my friend, Biona who knows quite a far bit about cast-iron cookware and advised me to get one either with a satin finish or an enamel finish. These finishing will save me pain when washing. I have chosen a 9” skillet pan as it is the preferred size in most recipes. In the end, I went home with a vintage, (lime) green satin finish skillet pan. I can think of a lot of recipes that I want to test with my new pan – tarte tatin, skillet cake – but first I got to season the pan. Seasoning the pan is rather easy (if you got an enamel finish pan, there is no need to season it). Once the pan is seasoned, it may smell a bit rancid, and feel sticky but this is part and parcel of owning a cast-iron. The first dish that I made with my cast-iron skillet pan is Dutch baby pancake. You can of course use any oven-proof dish/ pan or muffin tray. But there is something rustic and homey about using a cast-iron for this dish. Vanity aside, there is some science behind on why sometimes it is better to cook or bake with a cast-iron. Cast-iron pan retains heat very well hence allowing even cooking over the stove or in an oven. And because of this benefit, you want to gently warm up the pan. If you heat the pan aggressively, and lower the fire at a later stage, the cast-iron still retained the high heat and whatever you are cooking might get burned. 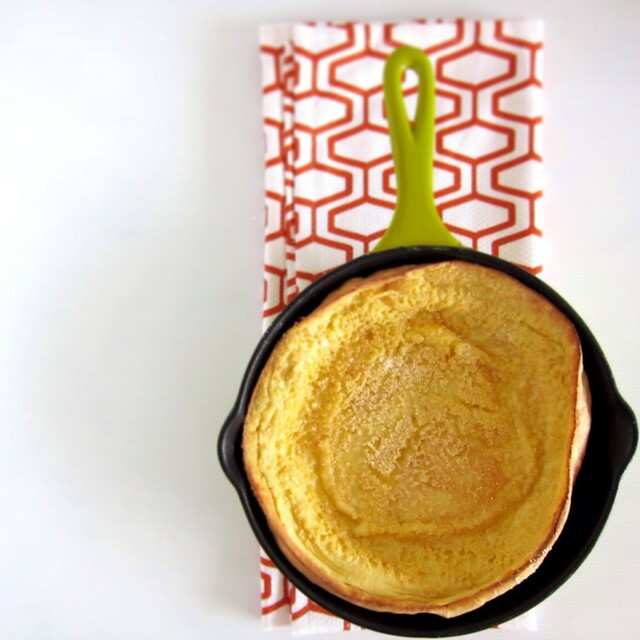 The Dutch baby pancake is like a puffed up soufflé pancake which is eggy and airy. It is pretty amazing to see it blossom in the oven. Because the pancake is rather sweet, you do not really need to dose it with maple syrup. I had it simply with salted butter and a squirt of lemon juice. It makes a beautiful breakfast or lunch or dinner. - Preheat the oven to 220oC. - Using a 9” cast-iron skillet (or any similar size oven-proof pan), add in the butter and melt it over medium heat. If the pan you are using cannot be used over open flame, just put the pan in the preheated oven and let the butter melt. Once the butter is melted, remove the pan from the oven (if you continue to leave the melted butter in the oven, it might split and burn). - Using a whisk or an immersion blender or a blender, mix the eggs, milk, flour, salt, vanilla extract and sugar until the mixture is foamy. This will take around 1-2 minutes. - Pour the batter into the skillet and bake until the pancake is puffed and lightly browned. I preferred my pancake to be gooey in the middle so I do tend to under-bake. This usually takes around 15 minutes. If you prefer your pancake to be more well-done, leave it in for another 5 minutes. - Once done, remove the skillet from the oven and serve the pancake immediately. Do not be surprised that the pancake will almost immediately collapse once removed from the oven. - To serve, sprinkle icing sugar with butter and wedges of lemon.